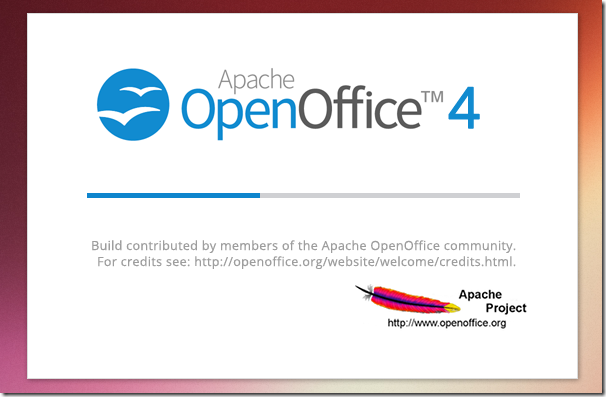 Apache OpenOffice suite which was previously known as OpenOffice.org has just been updated to version 4.0 and is available for download from its official download page. This is a major update and brings exciting new features and enhancements along with many bug fixes. Some of the features released with this version are: a new sidebar, improvements in Microsoft Office interoperability, support for more languages and a major performance boost. For more about this release and all of the other features included, check out its release notes page. This brief tutorial is going to show you how to easily install or upgrade to the latest OpenOffice version in Ubuntu 13.04 and previous versions. You can use it in place of LibreOffice if you want. I am not recommending it, but it’s up to you to do what you want with your computer. I am not going to tell you to pick a side between LibreOffice and OpenOffice. All I am going to show you is how to install AOO in Ubuntu and use it. To get started, press Ctrl – Alt – To on your keyboard to open the terminal console. When it opens, run the commands below to completely remove LibreOffice from your machine. It’s wise to remove LibreOffice before installing OpenOffice. Don’t worry, I will also show you how to revert the changes you made to your computer after installing OpenOffice. Next, change into the /tmp directory to download OpenOffice file. When you’re there, run the commands below to download the latest version (32-bit English) of OpenOffice. To view the download page and select other languages, use this page. For 64-bit English version, use this link. When the file is downloaded, run the commands below to extract the downloaded file. Next, run the commands below to begin installing it. Next, run the commands below to install the desktop-integration for .deb Linux distributions. When you’re done, restart and enjoy! To revert the change and reinstall LibreOffice, run the commands below to completely remove Apache OpenOffice. Then install LibreOffice by running the commands below.